It is an exciting time to be a Hearthstone player. Yesterday, Blizzard announced a number of balance changes that will go live before the Last Call tournament, so we are looking forward to a new metagame in around one week! The state of the game had become worrying. 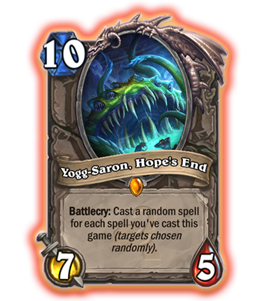 Yogg-Saron was a dominating force, especially in Druid, and the decks that could truly challenge it, Shaman (actually the most popular class) and Hunter, relied on ending the game before Yogg-Saron’s crippling effect. Warrior was the only truly competitive control deck, as it possessed an abundance of removal tools and the ability to gain a significant amount of armor on top of health, thus effectively having no health cap unlike other classes. With the upcoming changes, however, hope has by and large been restored, and life looks better again. Let’s take a deeper look into the changes.